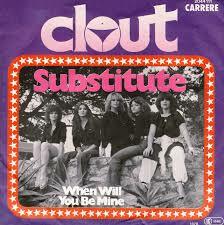 ‘Substitute’ by Clout enjoyed a 3rd week at the top of the charts, still under pressure from Bonnie Tyler’s ‘It’s A Heartache’ which spent a second week at 2. One of last week’s star raters, Peter Allen’s ‘I Go To Rio’ was the climber of the week, moving up a further 5 places from 14 to 9. This was the 16th time an Australian act had taken the award. This would be the only star rater this week. On the falling front it was Margaret Singana’s ‘I Never Loved A Man (The Way I Love You)’ which had the biggest tumble as it dropped 4 from 11 to 15. This was the second week running that it had taken the faller award. Joe Dolan’s ‘I Need You’ was at 18 and enjoying its 17th week in the chart and the 5th as the oldest in the top 20. There were 3 songs that dropped off the top 20 this week, the first of which was Bruce Foster’s ‘Born To Break My Heart’. It had lasted just 4 weeks and peaked at 18. It joined 6 other songs in having the second lowest peak for a song spending 4 weeks in the charts with Manfred Mann’s ‘Oh No Not My Baby’ holding the record to date of a peak of 19 for a 4 week run. This would be Bruce Foster’s only foray into our charts. Trevor Rabin’s solo career in the charts ended after just 1 hit, ‘Fantasy’. It had spent 8 weeks in the charts and peaked at 12. His best as a member of Rabbitt was a peak of 9 with ‘Charlie’ and 14 weeks by ‘Locomotive Breath’ (which peaked at 14). Rabin would return to the charts as a member of another group other than Rabbitt. This would be his last appearance as a producer (although producers were not always listed). He had had this credit on 5 hits, Rabbitt’s ‘Charlie’ and ‘Morning Light’, Julian Laxton Band’s ‘Blue Water’, Margaret Singana’s ‘I Never Loved A Man (The Way I Love You)’ and ‘Fantasy’. Fleetwood Mac’s ‘Go Your Own Way’ went its own way (okay, not really it was the way 2 other songs went this week as well). It had managed a run of 10 weeks and a peak of 4 which was by far the best performance of their 4 hits to date with none of their previous 3 making double figures for weeks nor going top 10. Smokie returned to the charts with their 5th hit to date, ‘Needles And Pins’. The song was written by Jack Nitzsche and Sonny Bono. Nitzsche had worked with Neil Young and been a member of his backing band Crazy Horse while Sonny had seen 2 SA chart hits (‘I Got You’ and ‘The Best Goes On’) as one half of Sonny and Cher. Jackie DeShannon was the first to record ‘Needles And Pins’ and took her version to 84 in the US in 1963. The following year, English band The Searchers topped the UK charts with a cover of it. Smokie’s version would make it to number 10 in the UK and 68 in the US as well as topping the charts in Austria, getting to 2 in Germany, 4 in Norway, 5 in Holland and Belgium and 7 in Switzerland. So far, only 3 of Smokie’s hits in the UK had not made our charts. Our second new entry was ‘Mellow Lovin’ by Judy Cheeks. Cheeks was the Goddaughter of soul singer Sam Cooke and her first album released in 1973 (simply entitled ‘Judy Cheeks’) was produced by Ike & Tina Turner. ‘Mellow Lovin’ gave her a number 65 hit on the US Billboard Hot 100 as well as going to 10 on the Dance Music/Club Play charts there. In Europe it would manage to get to 28 in Belgium. Cheeks would go on to have 5 UK hits, starting with her 1988 offering ‘I Still Love You’ which managed to scrape a 98 peak there. Our final new entry was Sharon Tandy and Hawk’s (sometimes known as Joburg Hawk) Dave Ornellas who went under the name Harvest. Their hit was not a cover of the 1973 UK number 1 hit for Peters And Lee but was a cover of a song written by Hans van Hemert and Willem Duyn and recorded by Dutch act Big Mouth And Little Eve. Big Mouth was ‘Mouth’ from Mouth & McNeal. This was the 5th hit to chart that featured van Hemert in the song writing credits. Sharon Tandy had had 2 hits before this, both as part of a duet, the first being with Billy Forrest (covering Mouth & McNeal’s ‘Hello-A’) and the second being with Graham Clarke. Smokie’s new entry clocked up their 50th week in the charts for them. They were the 56th act to reach this milestone. On the weeks count list, we saw Abba closing in on second placed The Hollies. Abba were on 134 while The Hollies were on 137. Just below them The Bee Gees had their eye on 4th place. They were currently 5th on 129 weeks, just 2 behind 4th placed Elvis Presley on 131.